There are a number of reasons why a property owner would be required to install a new fire sprinkler or combined water main. 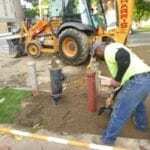 The most common reason would be if you are being required to install a new main by DOB. In this case you are most likely renovating the property or building from the ground up.The rules and requirements for installing new fire sprinkler mains are constantly changing, for this reason we always suggest that you consult with your architect to determine the exact details your project is going to require. 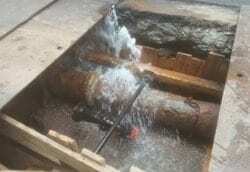 Another common reason would be if your existing fire sprinkler main is leaking. In this case the replacement would be completed on an emergency basis. It is important to understand the DEP regulations and requirements even if you are replacing an existing main. 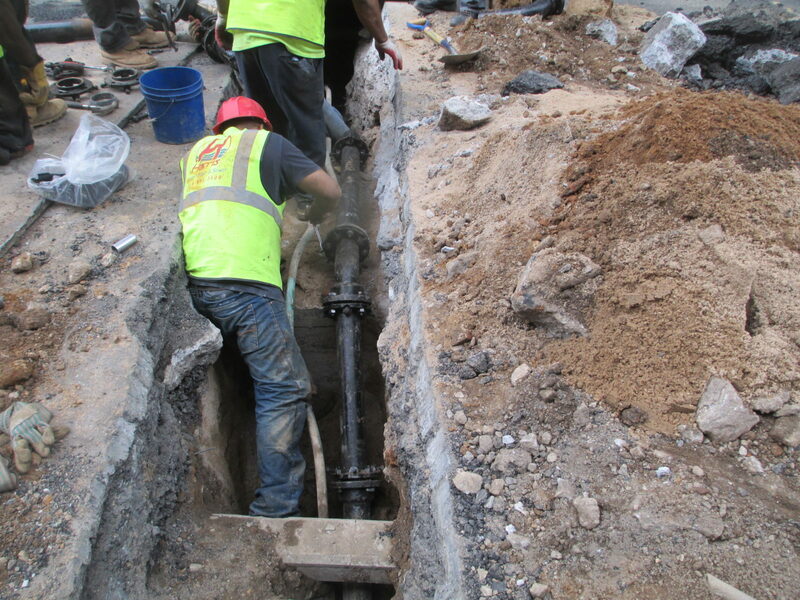 Depending on the size of your water main you may be required to upgrade the size, even if it is an existing sprinkler main that has been in the building for over 50 years. 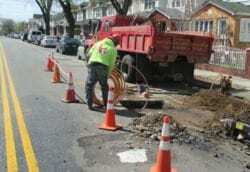 The installation of all water mains feeding a fire sprinkler system are required to obtain a DEP inspection. 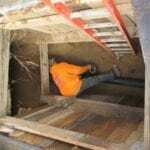 Once scheduled a DEP inspector will arrive on-site to inspect each section of piping before the excavations are back-filled. 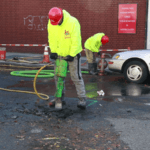 All fire sprinkler mains are required to have a curb valve installed on the sidewalk and an OS&Y valve installed on the inside of the building. 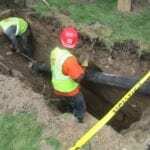 The inspector is required to inspect the piping installation and confirm that that piping is installed per the DEP code. 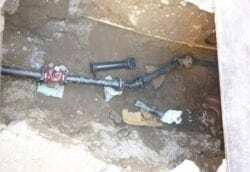 The inspector will also confirm that the piping is installed in accordance with the approved plans. 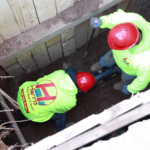 Our installation division features a staff of experienced field supervisors and crew members who will oversee the entirety of your project. 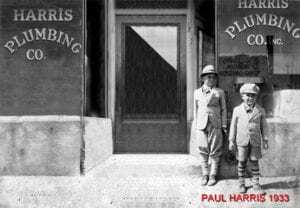 After over 100 years of proving ourselves in the field, our sprinkler installations and repairs have garnered us a reputation of being the most competent fire sprinkler specialists in the industry. When working on filing for NYC, DOB & DEP permits for a new sprinkler or combined system, there are two sets of approved plans that the licensed plumber is required to submit for DEP to review prior to releasing permits. A DOB (Department of Buildings) approved plan showing the sprinkler service, water meter and/or check valve. The cross connection letter which is the DEP approval for your Backflow Prevention Device. 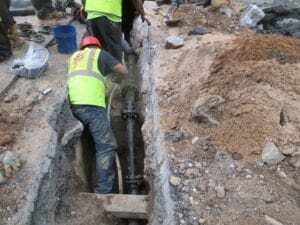 Does your Fire Sprinkler System require a tap or a wet connection on the city main? 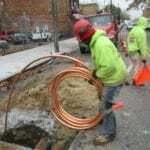 If you are installing a new 2”copper main or anything smaller in size, you will be required to install the same size tap connection on the city main. 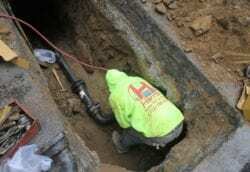 This differs from a domestic water service where the tap connection would be one size smaller than the pipe. 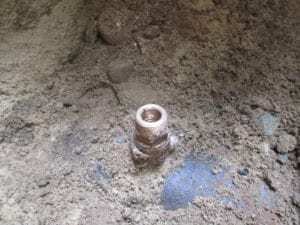 In most cases when installing a new 3” ductile iron sprinkler service or larger, you will be required to install a wet connection of equal size to the pipe unless approved plans state otherwise. 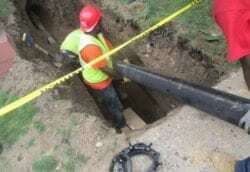 Example: A 3” ductile iron pipe would require a 3” wet connection to be connected to the city main. The only exception to these rules would be if the contractor is making a repair to a existing 2.5” or 3” sprinkler main that was previously hooked up to a 2” tap connection. 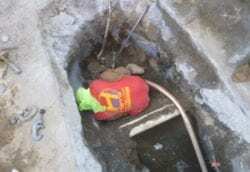 In this case the contractor would re-connect back to the existing 2” tap on the city main. 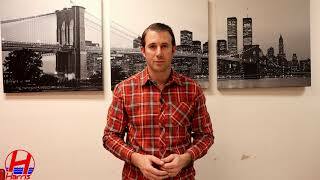 What is a Backflow Prevention Device and why are they required? Backflow prevention devices prevent contaminated water or chemicals from flowing backwards into the public water system from the fire sprinkler system. 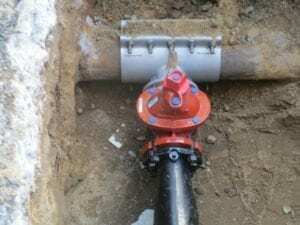 Certain types of business that are more prone to contaminated water and most buildings with a sprinkler system require a backflow prevention device. 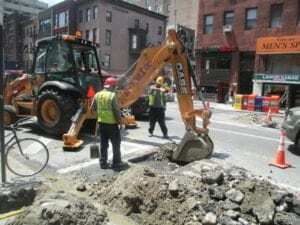 Backflow Prevention Devices are an essential piece of the “New York City Department of Environmental Protection’s Drinking Water Protection Program”. 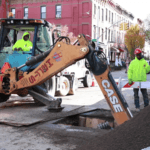 Backflow Prevention Devices are now mandatory under the “New York State Sanitary Code and the Rules of the City of New York” for any businesses that may serve as a risk to public water supply.